A viral video that was passed around on social media last year has finally reached a conclusion after a now former teacher was accused of using drugs in her own classroom after her own students turned her in. 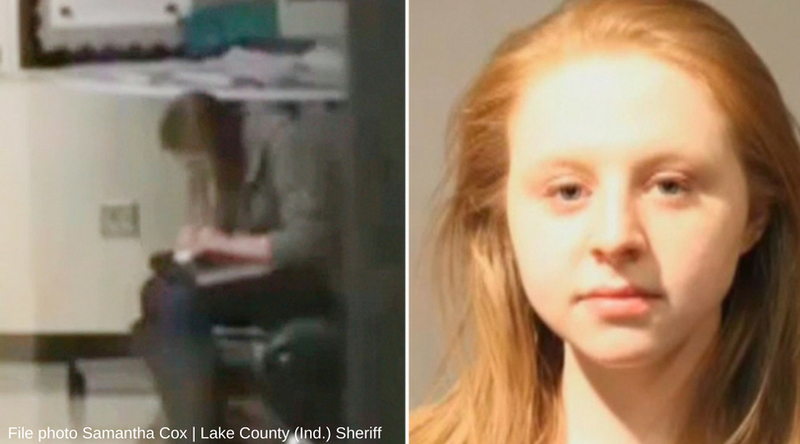 Former Lake Central High School Teacher Samantha Cox, 24, was caught by a student who “had video of what appeared to be a teacher ‘snorting’ a line of an illegal substance,” according to the probable cause affidavit. The video made its rounds on social media outlets sparking outrage from parents across the states. At Cox ‘s last court appearance, accompanied by her legal team she entered a guilty plea to the charge of possession of cocaine. She took a deal that would recommend 12 months of probation along with the completion of a drug treatment program. “There’s no question this occurred on school grounds?” Vasquez asked Cox. Vasquez also asked Cox if she admitted to possessing cocaine. Cox said she did. Vasquez then went over Cox’s rights that she was was giving up in the deal. “Do you still wish to plead guilty?” Vasquez asked her. As of yet, Judge Salvador Vasquez has not publicly decided on accepting the deal and ordered a pre-sentence investigation report and asked for more time to review documents for the case. The judge asked the defense to prepare a summary of Cox’s medical and treatment reports for him to review before making a decision on the deal. The case is scheduled to reconvene for sentencing on September 14th, almost one year after police were called to the school following the incident. She admitted that she was unable to use before school started and decided to bring it inside the school and use some on her break around 10:20 a.m., according to an affidavit. She was arrested without incident and eventually resigned from the district where she was employed with Lake Central High School. Following her arrest, Cox has completed an inpatient treatment program according to her attorney Ray Szarmach, and has found employment with a psychiatrist’s office. Although the charge Cox pleaded guilty to is a level six felony, through her agreement, the judge could enter the conviction as a misdemeanor instead.